Cubby House Crafts: What are the chances???? Early this morning I spent some time taking some pictures of what I thought was a Yellow throated Honey Eater for our 'Y' Snappy Friends challenge. 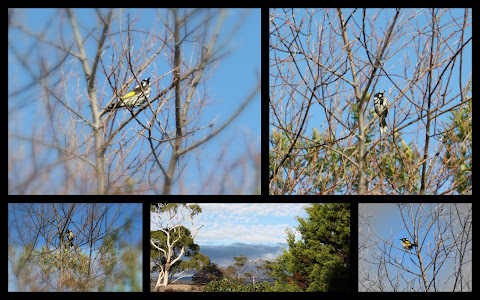 After I made this collage, I thought that I had better make sure I had my bird names correct, and discovered that it is in fact a New Holland Honey Eater, so I was unable to use this collage for the challenge. Later in the morning I went to the sewing room to do some more painting and to discover a Yellow Throated Honey Eater inside my sewing room!!!! What are the chances of that!!! He wasn't even stressed by his ordeal, and let me take a couple of pics before he flew out the door! We have quite a few families of New Holland Honey Eaters in our garden, but to see a Yellow Throated Honey Eater is quite rare!!! Maybe he came to Christian my new sewing room! LOL! The little bird must've known you were looking for him/her! He's a cute little birdy...hope he didn't make a mess! That little birdie had great timing! what a special visitor... beautiful too. Somethings are just meant to happen. Now you will have to immortalise your little bird into one of your stitcheries Lisa. A great story. Now that is a special moment captured on camera. We have lots of New England Honey eaters here they make an amazing noise when they are threatened. I think the little bird was a Blessing :) Very cool!